Dental Fix has awarded its 66th, and 67th franchises of 2014, in Los Angeles, California to Majid Sabour, Dental Fix announced today. The signed agreements targeting the Santa Monica, and Beverly Hills markets, will be the 13th, and 14th vans to launch in the State of California, and is part of an aggressive North American expansion plan calling for 700 new vans over the next five years. With 119 territories currently operating throughout the US and Canada, Dental Fix is well on its way. “The potential for Dental Fix is endless as it is the only site dental equipment service franchise in the industry,” said Lopez. “We couldn’t be more excited about launching two more Dental Fix vans in California”. The Florida based Dental Fix Franchise Company is revolutionizing the dental service industry by delivering immediate on-site hand piece repairs and equipment service and sales, through a dedicated mobile network of highly trained and successful industry professionals. The company currently has 119 territories open and operating. If you saw the November-December issue of the Apex360 digital magazine, you know that the mobile dental equipment repair franchisor Dental Fix Rx is rapidly expanding its customer base. In the first three years that followed its 2009 inception, the franchisor acquired 1,500 customers. Between 2012 and 2014, as the quantity of franchises or “rolling repair shops” increased, that figure grew to exceed 8,000 customers. The number of franchises sold has increased too – with the milestone 150th franchise sale having just occurred this past August. So, it should come as no surprise that the number of manufacturers with which the company works is growing, as well. On Wednesday, Dental Fix Rx announced a new partnership with manufacturer Boyd Industries. Through the new arrangement, Dental Fix Rx has agreed to provide repair services that cover all of the equipment developed by Boyd Industries, which ranges from clinician and patient chairs to gaming consoles for pediatric patients. 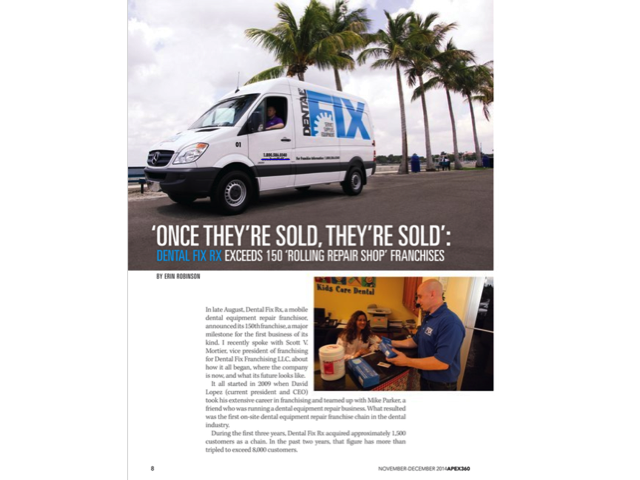 To read more about the growth of Dental Fix Rx and about what sets it apart from other dental equipment repair companies, see our extended story in the Apex360 digital magazine. To learn more about Boyd Industries, visit boydindustries.com.